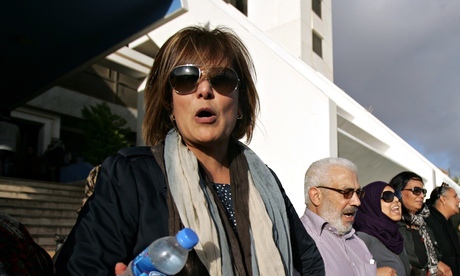 A human rights activist who had been a prominent figure in Libya’s Arab Spring revolution in 2011 was killed at her home yesterday during the general election. Salwa Bugaighis was killed by a gunman who broke into her home in Benghazi, also wounding a security guard and abducting her husband, who is still missing. It is believed the couple had just returned from voting when the gunman attacked. Earlier in the day, Bugaighis has been speaking on phone on live television denouncing militants who had attacked army troops positioned at a polling station near her home. Bugaighis, a lawyer, helped lead the charge during the February 2011 revolution. She later resigned from the first rebel administration, accusing it of excluding female members. An activist for women’s rights, she opposed women being forced to wear the hijab, which brought her into conflict with the Muslim Brotherhood and Islamist extremist. She also championed a campaign to set minimum quotas for female representation in parliament, which was successful. Hanan Salah of Human Rights Watch said yesterday that „the killing seems intended to silence critics and muzzle dissent. Earlier this year Bugaighis and her family left Libya after one of her three children had been threatened by gunmen. The returned just months ago ready to continue campaigning.